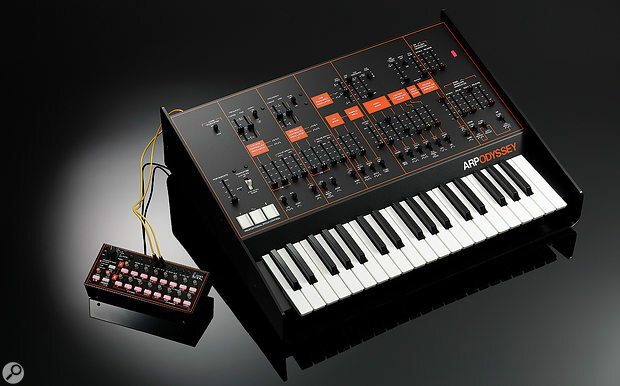 Thanks to Korg, it’s once again possible to walk into a shop and buy a brand‑new, full‑size ARP Odyssey. A year or two later, the company built a small number of full‑size instruments in New York, but these were sold almost as soon as they were announced, and I failed to get my hands on one. Then, a few months ago, a rumour circulated that the full‑size Odyssey was about to go into production in Japan, and so it proved. Lacking the super little carry case of the miniature KARP, but bundled with an ARP‑badged Korg SQ‑1 sequencer, this was designated the Odyssey FSQ, which, not surprisingly, stands for Full Size with an SQ. 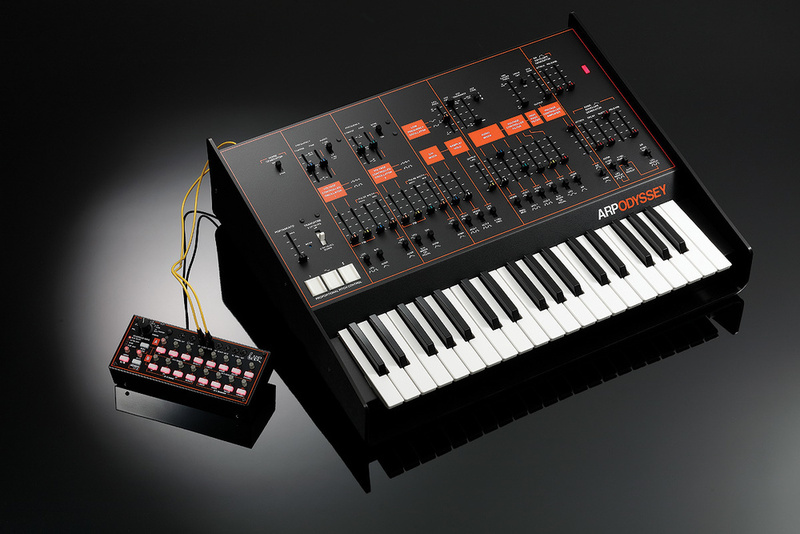 The FS is an almost precise clone of the original Model 2800 to 2815 (MkI and MkII) Odysseys, the ones with the wrap‑around vinyl case and the bent‑steel frame and control panel. It’s available in the three original colour schemes although (ironically, given the case design) the black and orange livery of the physically different Models 2820 to 2823 (usually called the MkIII) is the standard, and the livery of the white‑face MkI and black and gold MkII models is only available in limited editions. Other visible changes are limited to the use of the PPC (pitch‑bend and modulation) pads on all models, a couple of extra controls, and a few extra holes on the back panel. Like its smaller predecessor, the FS embodies all of the improvements introduced in 2015: the overdrive and (possibly accidental) feedback capability offered by the addition of a headphones output, the dual portamento modes and, of course, the excellent decision to incorporate Korg’s recreations of all three filters from the original models — the sparkling 12dB/oct ARP4023, the Moog‑like 24dB/oct ARP4035 and the flawed ARP4075. While technically different from their inspirations, these filters emulate the sounds and characters of the vintage devices with great accuracy. Although the main board in the FS is different from that in the earlier KARP, the underlying technology is the same and I’m not aware that there are any sonic differences between them. To be fair, I didn’t have the two next to each other to perform an A/B comparison but, had I done so, I’m confident that any audible differences would have been insignificant — merely two units of the same vintage synthesizer. In support of this view, the tests I performed when comparing the FS to my original Odyssey showed the same, minor differences that I had noted in 2015 — for example, slightly greater maximum modulation amounts and slight differences in the time constants in the contour generators. But, as far as I’m concerned, these are insignificant because, with appropriate settings, the original Odyssey and the FS can be made to sound identical. Alongside the Odyssey itself, there’s the SQ‑1 sequencer. Korg have been shipping this neat little box for several years, both as a stand‑alone unit and as an adjunct to the MS20M. While it would have been lovely had Korg recreated the ARP 1600‑series sequencers that were designed to partner the ARP2600, Odyssey and Axxe, these were much larger and more expensive affairs offering three gate output busses, faders and CV inputs for frequency modulation and PWM of the duty cycle of the gate, dual patchable quantisers, a CV input to transpose sequences, a four‑way multiple, and more. Whether for good or for ill, the SQ‑1 is more streamlined and more modern in feel and function. Like the ARP sequencer, it offers 16 steps that can be configured as a single sequence or as parallel eight‑step sequences, with linear and random modes, and quantisation if desired. Despite being less patchable than the ARP and, in particular, lacking its transpose capability, the SQ‑1 adds a five‑pin MIDI out and USB MIDI in/out (albeit without the ability to recognise or use CCs), and it also offers both V/oct and Hz/V options. You can even use it as a simple USB/CV converter, which makes it interesting if you intend to disconnect it from your Odyssey and hook it up to a modular synth. A slide function is provided for when the mood takes, but swing has gone absent without my permission, and there are no memories, which means that there’s no way to chain sequences into songs. Furthermore, power can only be provided by batteries or USB, which can be less than ideal. Oh, and I did I mention that it can’t transpose? Yeah, I thought that I did. Despite lacking the characteristic warmth of the Minimoog, the Odyssey — and, in particular, the bright and energetic MkI — was always a synth that encouraged soloing. Given that its performance controls were so limited (merely a tuning knob!) this is more than a little surprising, but its sound was perfect for widdly‑widdly solos and, even more than its great rival, it was able to cut through the densest mixes. What’s more, it was more adept at emulating orchestral instruments and, unless you took the step up to a modular synth, it was an almost unparalleled generator of sound effects. In the early 1970s, its only rival in this regard was the EMS VCS3, which did nothing unless you stuck patch pins into appropriate holes, and was therefore much harder to understand and use. Consequently, for old farts of a certain age, a full‑sized KARP is a dream come true. It not only looks and sounds like an Odyssey, but it plays like one too and, whether you approve of them or not, those widdly‑widdly solos sound perfect on it. But if there’s an area in which Korg could have stretched the rules a little, it’s that of keyboard response. When Moog’s engineers recreated the Minimoog a couple of years ago, they added velocity‑ and aftertouch‑sensitivity, which opened up significant new opportunities for sound generation and performance. Korg declined to do this for the Odyssey, which, in a strange way, is simultaneously to the company’s credit and a great shame. Since velocity and aftertouch are neither generated nor received over MIDI, and only two CCs (All Notes Off and Reset Controllers) are recognised, it’s almost as limited as the original synth... but not quite, because, while the pressure exerted on the PPC pads (bend up, bend down and LFO amount) isn’t transmitted, the synth receives pitch‑bend. This might seem like a small point, but it makes a huge difference if you intend to record and replay performances using MIDI. Unlike the miniature KARP (which doesn’t receive pitch‑bend) you can play the FS using a controller keyboard that transmits note on, note off and pitch‑bend, record the MIDI stream and later replay this with the pitch‑bends intact. If you’re thinking of using a KARP in the studio, this could be the difference between it being usable or not. Unfortunately, you still can’t sequence any changes in the amount of modulation, since the output from the PPCs is neither transmitted nor is any substitute received. While I understand the reasons behind Korg’s decision, it’s a significant limitation. Another thing that Korg have forgone is the addition of patch memories. This is also understandable; the added circuitry might have changed other attributes of the synth, and there would undoubtedly have been those who complained about the quantisation of the stored parameters, no matter how long the word length that was used. It would also have increased the price considerably. But one can dream! Anyway, that’s enough of the quibbling. In the time that I spent with the Odyssey FS it performed flawlessly and, with its more responsive keyboard and smooth and noise‑free faders, it was much nicer than my original Odyssey. Before I knew what was happening, I found myself playing and thoroughly enjoying solos that should have been put out of their misery shortly after I wrote them in the ’70s and ’80s. Hooking it up to the SQ‑1 was more of a voyage into the unknown since I had never previously used an Odyssey in this fashion but, despite the sequencer’s limitations, I have no doubt that some players are going to enjoy the combination more than a little bit. I can remember the excitement of unwrapping my first synthesizer in the 1970s. It’s hard to recapture those feelings after more than 40 years, but removing the Odyssey FS from its box managed to do so. It’s no secret that I love Odysseys, so I’m undoubtedly a bit biased, but a pristine white‑face untouched by human hands (or any other hands, as far as I’m aware) is a thing of deep joy. It’s not cheap, but neither is it particularly expensive, costing well under half the price of the recreated Minimoog Model D or Oberheim Two Voice Pro. In fact, its price pales into insignificance when compared with the cost of the original, which is equivalent to nearly £10,000 today. If you love the sound of the Odyssey and mini‑keys cause you no inconvenience, the miniature KARP is probably the right model for you but, for me, the difference in price is irrelevant; there’s no point paying £779$799 for something that I can’t play, whereas £1459$1699 is a reasonable price for a classic musical instrument that I can. When push comes to shove, there’s no alternative to a MkI Odyssey; like the Minimoog, it’s a synth that stands alone, and Korg’s recreation is a nigh‑on perfect recreation with bonus features. Three years ago, when reviewing the miniature version I concluded that “a full‑sized KARP with all of the attributes of this iddy–biddy one will be almost irresistible.” I was right. I can’t resist. Nowhere in Korg’s documentation does it describe the rear panel and how to use its various ins and outs. Fortunately, most of it is obvious to the experienced synthesist, and the capabilities of the MIDI out and USB socket can be gleaned from the MIDI Implementation Chart. My only complaint here is (inevitably) the use of a wall wart rather than an internal power supply. Serious equipment deserves serious power connectors. At the very least, a locking XLR connector such as that used on original Odysseys would have been better. Oh well... at least there’s a stress relief hook. Everything that made the Odyssey a classic that has endured for nearly 50 years! You can select your favourite Odyssey filter, with or without overdrive (but you should then settle on the ARP 4023 from the MkI). It’s new — everything works beautifully. The MIDI implementation is very basic — perhaps too much so. Korg have declined to add velocity- or aftertouch-sensitivity. It uses a wall wart rather than an internal PSU. The SQ-1 is fun but, in my view, a bit too limited for serious use. If it looks like an Odyssey, sounds like an Odyssey and plays like an Odyssey, I think that I’m on pretty safe ground to say that it is an Odyssey. Or, to be more accurate, it’s a genetically modified Odyssey that’s better than ever before. It’s not quite perfect, but what is? I think that I’m in love.